Fort Hamilton is a substantial Victorian fort with a panoramic view of Hamilton Harbour, built in the mid-19th century during a period of rising tensions between Britain and the USA. 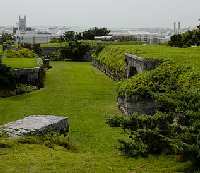 The ramparts are mounted with 18 ton artillery pieces capable of firing 400 pound (181kg) cannonballs through iron-hulled vessels. Nearby is Clarence Cove, a popular beach forming part of Admiralty House Park. The house itself dates from the early 19th century, built as the residence of the Royal Navy's regional commander. Another military echo along North Shore Road, Black Watch Well, was dug by troops of the famous Scottish regiment during a drought in 1849.